This is the prettiest, easiest, lovliest new earring! Hanging diagonally from a surgical steel earwire, an antique silver filigree square sits exactly on top of a bright shiny silver square. You only get a glimpse of the shiny piece through the openings in the filigree piece when the light catches it and then - SURPRISE! It sparkles like there are diamonds! I have never worn a pair of earrings that gets so many compliments! They go as equally well with jeans as they do with your fanciest dress! They have rapidly become our most popular earring style - and they are available in lots of color combinations. I wish I could capture the sparkly beauty of these earrings in these pictures! They measure just under 1-1/2" from the top of the earwire and are 3/4" across. 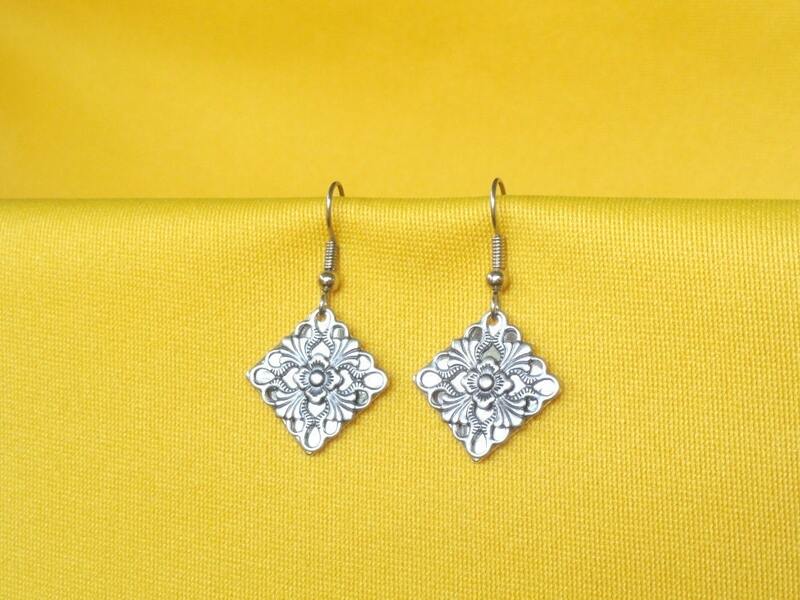 These beautiful earrings come in lots of color combinations! Just search the word "surprise" in our shop and you will be surprised! (tee-hee) at how many come up! Fast shipping and well made. Will check here first whenever I need earrings or pendant for myself or a gift. Wonderful pair of earrings. Just love them.